Typical sit-stand-walk desks can often be too wide for many prospecting users who have more restricted floor space. iMovR's new Tempo TreadTop ergonomic office chair transforms treadmill desks of any size into a fully-fledged sit-stand-walk workstation. More than any chair on the market, the Tempo Chair is perfectly suited for use atop any office treadmill. And its unique seat materials and adjustment range create a sitting experience unlike any other. Free shipping in continental US. Additional charges in AK, HI, and Canada. DHL shipping for international. Seat size: 17.75" x 16.75"
Seat back size: 10.5" x 17.75"
Circular chrome base designed to fit atop the majority of office treadmills, while the seat back has a convenient handle for easy transport. Polyurethane seat and seat back conform to your body to provide the right amount of comfort and support as you sit. Seat and back adjustments round out the chair's ergonomic profile. Made in America, and features a lifetime warranty. Polyurethane seat design comes in just one color and is less aesthetically-pleasing than more design-focused chairs. Arm rests feel stiff. The Tempo TreadTop Chair is the first ergonomic chair designed specifically for the office treadmill. A 17"-wide circular base provides stability and balance without risking damage to the treadmill belt. A convenient handle makes it easy to transport on and off of the treadmill. Its unique polyurethane construction boasts thermoelastic characteristics that conform to your body as you sit, resulting in a truly personalized ergonomic sitting experience. The made-in-America Tempo seats feature an unbeatable lifetime warranty, ensuring years of enjoyable sitting breaks on and off the treadmill. We’re often asked what our ideal office setup is, and our answer is always the same: a sit-stand-walk station. This configuration includes a chair and a treadmill, as well as space for comfortable standing. It makes it easy to seamlessly transition between standing, walking and yes, even sitting, maintaining a healthy amount of comfort and energy throughout the day. Typically, you need a desk at least 72” wide to fit a treadmill and a chair side-by-side. But not all workers have the space or budget for a large desk. But smaller desks can’t fit a treadmill and a chair. So what’s a fitness-seeking office worker to? The only option is to place your chair on top of your treadmill deck. But as you might imagine, finding the right “treadtop chair” is easier said than done. 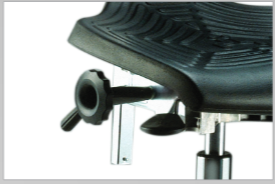 The typical office chair’s casters are far too wide to rest on a treadmill belt, which measures around 18” – 20” wide. Cheap, compact folding chairs, on the other hand, are uncomfortable to sit on for long, and can have dangerous feet that can tear into your treadmill belt. Over the years, we’ve side-stepped the issue by utilizing “active seating” chairs and stools—like the Focal Mobis and Mogo, Aeris Muvman, Biofit, and even the posture-correcting Back App—as temporary seats that can be lifted onto the treadmill when it’s time to take a sitting break. But none of these products were designed specifically for use with a treadmill, and they’re all ill-suited as ad hoc “treadtop” chairs. There just hasn’t been a dedicated chair suitable for office treadmills. 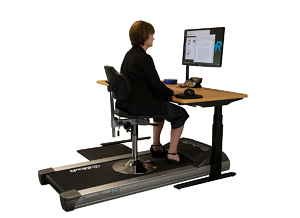 That’s all changed, however, with iMovR’s introduction of a new line of office chairs specifically built for use on top of an office treadmill. These Tempo TreadTop chairs turn treadmill desks of any size into full-fledged, sit-stand-walk workstations. They’re so named for the way they allow you to rapidly switch between sitting, standing and walking, without disrupting your work tempo. There are two Tempo seat models. This review focuses on the Tempo Chair, which offers the same creature comforts of an ergonomic office chair in a treadmill-friendly construction. But be sure to check out our review of the Tempo Sit-Stand Stool, the versatile and easy-to-move seating solution for both sitting and standing users. Both these models are designed to help you switch quickly and effortlessly between sitting, standing, and walking. The Tempo TreadTop Chair’s design has been optimized for use atop a treadmill. It features a 17”-wide chrome circular base compatible with all office treadmill decks, which typically measure between 18 and 20 inches wide. This flat base distributes weight evenly across the treadmill belt, preventing the abrasion and puncturing that more conventional chairs risk when used on a treadmill. The chair is easy to lift onto and off of the treadmill, thanks to a convenient handle built into the backrest, but is still robust enough to provide safety and stability. The Tempo TreadTop Chair is a natural fit for treadmills—we never once felt off balance or unsecure on the treadmill. The Tempo Chair’s most striking feature—or at least one that immediately catches your attention—is its innovative 17.75” x 16.75” seat, which is made of a molded polyurethane blend. 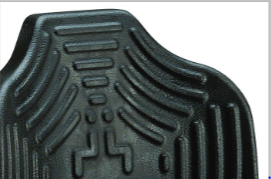 This material is similar to that used in iMovR’s EcoLast standing mats, known for their durability and comfort (and lifetime warranty). A side effect of this polyurethane construction is that these seats don’t have quite the aesthetic luster of traditional executive office chairs. But while this chair isn’t cut from the same cloth as more visual-oriented seats like the Capisco or the Back App (in fact, there’s no cloth at all) its unique construction provides a sitting experience unlike any other. The secret lies in the polyurethane’s thermoelastic properties. As your body heats up, the seat materials start to mold to the shape of your derriere, distributing your weight evenly and alleviating pressure points that can make other seats uncomfortable to sit on for long periods. This unique attribute provides individualized comfort for every user. Ridges in the seat create airflow and promote circulation, providing even greater comfort throughout the day. The polyurethane construction also makes the Tempo Office chair incredibly durable. Just like the polyurethane EcoLast mats, the Tempo Office Chair is 100% made in America and features a lifetime warranty. Among all the chairs we’ve tested, they are the first to feature such a bulletproof warranty. They’re guaranteed to withstand years of wear and tear, even as you ferry them to and from the treadmill. In addition to this seat, the Tempo Chair comes with a 10.5” x 17.75” polyurethane seat back that’s ergonomically molded to provide back support and maintain your body’s freedom of movement. The Tempo is also equipped with a shock-absorbing, sealed, pneumatic gas cylinder or “gas spring”—a feature usually reserved for high-end ergonomic chairs—that reduces low back muscle strain and improves circulation even further. Even short durations of sedentary sitting can cause fatigue and back pain over time. Frequently changing your position at work is necessary to reduce strain on your lower back and your hips. An ergonomically healthy position maintains the natural S shape of your spinal column and helps relax your spinal muscles. This improves blood circulation and nutrient supply to your body. Improper ergonomics, like the dreaded-but-commonplace “computer hunch,” leads to all sorts of aches and pains, and that can just kill your concentration and productivity—so for our money, good ergonomic design beats good aesthetic design any day. The Tempo Chair offers a wide range of ergonomic adjustability to guarantee proper work ergonomics. The seat pan adjusts in angle to help prop up your lower back and straighten your hips and knees. The seat back is independently height-adjustable, and has both fixed and dynamic angle adjustment for greater spinal support and more engaged back muscles. Compared to the clunky, oversized office chairs of old, the Tempo offers superior ergonomic comfort, and guarantees a much more pleasant, productive work day. It offers these ergonomic benefits, without the potential drawbacks of some of the more exotic active chairs. In addition to the standard Tempo Office Chair, iMovR offers a few optional accessories and upgrades for those power users looking to enhance their sitting experience even further. For greater foot relief during your sitting breaks, an optional foot ring is available. This 18”-wide ring attaches to the chrome cylinder and provides a solid rail for you to rest your feet on. It’s certainly better than placing your feet on your treadmill’s flimsy and fragile motor housing. To give your arms more support as you sit, the Tempo Office Chair is also available with a set of detachable arm rests. They’re independently height adjustable to accommodate any user. The arm rests are a little on the small side, and they’re not soft like a those of many other executive office chairs—but they’re comfortable enough for short to moderate sitting breaks, and they won’t be overly obstructive in getting on and off the chair when its positioned on top of the treadmill. The tread-top chair has been a long time coming, and iMovR’s first entrant in this new category is exceptionally well-designed and well-made—the Tempo TreadTop Chair is made in America and features a lifetime warranty. As such, it gets our unconditional experts’ recommendation for use on top of a treadmill, though it’s still surprisingly comfortable for off-the-treadmill use as well. The Tempo TreadTop seats are compatible with not only iMovR’s own ThermoTread GT but also the LifeSpan TR800, TR1200 and TR5000 walking treadmills, the Steelcase Walkstation, Rebel Desk, TreadDesk, Proform, NordicTrack and InMovement treadmill desks. Basically any treadmill base with a belt wider than 16”—basically, all models. And if you’re looking for a lighter, lower cost, and more versatile seating solution check out iMovR’s other Tempo treadtop seat, the Tempo Sit-Stand Stool, designed as both a sitting solution and a standing support aid. The iMovR Tempo TreadTop Chair ships free anywhere in the continental US. For freight to AK, HI, PR or international, please call. Sounds good, but what we REALLY need is a chair that can roll with enough ground clearance to fit over a treadmill without having to lift it.